New Rochelle, NY, September 27, 2018–A new white paper, developed by the Vatican-based Pontifical Academy for Life (PAV), describes the broad-based, expert-led effort to develop recommendations for improving global palliative care. Advances in palliative care are needed to aid the more than 25 million people who die each year with serious health-related suffering, as the current supply of palliative care cannot meet the growing demand, according to the white paper published in Journal of Palliative Medicine, a peer-reviewed journal from Mary Ann Liebert, Inc., publishers. The article is available free on the Journal of Palliative Medicine website in English and in Spanish. The article entitled "White Paper for Global Palliative Care Advocacy: Recommendations from a PAL-LIFE Expert Advisory Group of the Pontifical Academy for Life, Vatican City" is a product of the work by a group of experts in palliative care advocacy who represent different faiths and were invited by the PAV to develop strategic recommendations to advance global palliative care. The expert group identified 43 recommendations and 13 stakeholder groups, targeting the most important recommendations for each stakeholder group. A Spanish translation is also available. "This is of historic importance. The moral authority for much of the world is advocating palliative care for the first time," says Charles F. von Gunten, MD, PhD, Editor-in-Chief of Journal of Palliative Medicine and Vice President, Medical Affairs, Hospice and Palliative Medicine for the OhioHealth system. Journal of Palliative Medicine the official journal of the Center to Advance Palliative Care (CAPC), Australian and New Zealand Society of Palliative Medicine (ANZSPM), Canadian Society of Palliative Care Physicians (CSPCP), Asia Pacific Hospice Palliative Care Network (APHN), and an official journal Hospice and Palliative Nurses Association (HPNA) and the Japanese Society for Palliative Medicine (JSPM), is an interdisciplinary journal published monthly in print and online that reports on the clinical, educational, legal, and ethical aspects of care for seriously ill and dying patients. The Journal includes coverage of the latest developments in drug and non-drug treatments for patients with life-threatening diseases including cancer, AIDS, cardiac disease, pulmonary, neurological, and respiratory conditions, and other diseases. The Journal reports on the development of palliative care programs around the United States and the world and on innovations in palliative care education. 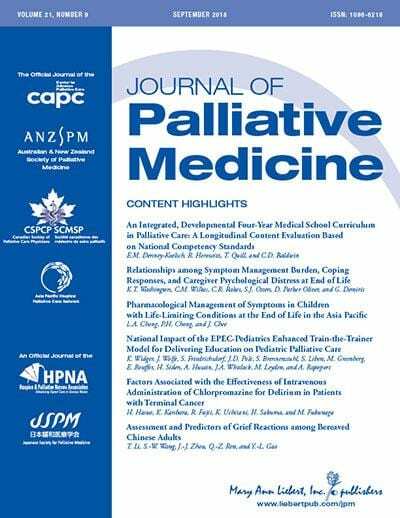 Tables of content and a sample issue can be viewed on the Journal of Palliative Medicine website. Mary Ann Liebert, Inc., publishers is a privately held, fully integrated media company known for establishing authoritative peer-reviewed journals in promising areas of science and biomedical research, including Population Health Management, AIDS Patient Care and STDs, and Briefings in Palliative, Hospice, and Pain Medicine & Management, a weekly e-News Alert. Its biotechnology trade magazine, GEN (Genetic Engineering & Biotechnology News), was the first in its field and is today the industry's most widely read publication worldwide. A complete list of the firm's 80 journals, newsmagazines, and books is available on the Mary Ann Liebert, Inc., publishers website.